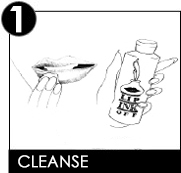 LIP INK Lip Stain Technology & Application from LIP INK on Vimeo. Also available are, Lip-Ink Lip liner, Brow Liner and Eye Liner with the same Guaranteed Smearproof & Waterproof qualities. 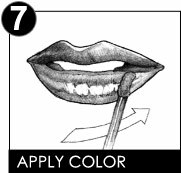 Follow the application instructions and always remember to hydrate the lips before color application, by applying any one of our 100 wax free lip moisturizers first. Our botanical color blends are liquid, like water "they can spill". 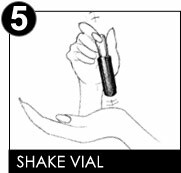 With each use, be sure to shake the vial against the palm of your hand until you hear the beads move freely to assure the pigments are blended. 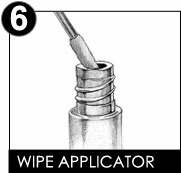 (Less is better with our color application, wipe off the excess liquid from the applicator tip and hold upright). For an ombre lip color tutorial click here. The award winning multi patented guaranteed smear proof lip satin color cosmetics are eco-friendly. Lip Ink's smear proof indelible lip stains are made from natural botanical ingerdients. You will never need to reapply or touch-up your lips because our lip stain colors are always smear proof.